What is the finger splint AM-D-05? This is innovative product, which can be used in hand surgery and is very helpful in rehabilitation process. The brace is equipped with splint made of polyamide with ROM adjustment. The adjustment is possible thanks to Allen key. The device has the open construction what allows to fit it to every shape and size. The brace consist of circumferential hand strap with thumb stabilization and two forearm straps and fingers tapes. The material of the brace is easy to attach so you can fasten the straps in the required position. 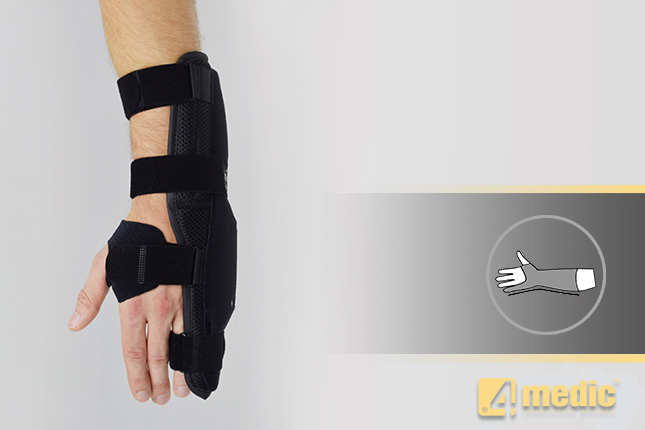 The brace is made of comfortable fabric ActivDistance II which is easy to attach. Thumb brace AM-D-01 made with innovative material AirSanmed. Inelasticity of the textile, allows maximum stabilization and immobilization of CMC joint. There is a cotton soft textile in contact with the skin that prevents against the sweating. AM-D-02 finger immobilizer splint is the universal orthosis, developed to be used for dorsal or palmar immobilization, for Right as well as Left hand. Hand brace to stiffen four fingers excluding the thumb. The design of the product allows the patient or physician to choose which finger is eligible for immobilization. Each time, the brace can lock from one to four fingers.